Designed by Rudy VanderLans. Set in Base 900, designed by Zuzana Licko. Printed by Blurb. 141 pp. 5″x8″. Black and white; illustrated. $14 or free with purchase of the ﬁve Museum of Modern Art “milestone” font families ($164). Visit Emigre.com. This small book has been published, “on the occasion of the acquisition of ﬁve of our font families by The Museum of Modern Art, New York in 2011,” according to Rudy VanderLans of Emigre. The ﬁve type families are: Oakland (originally Lo-Res) by Zuzana Licko (1985), Template Gothic by Barry Deck (1990), Dead History by P. Scott Makela (with the assistance of Licko) (1990), Keedy Sans by Mr. Keedy [Jeffery Keedy] (1991) and Mason (originally Manson) by Jonathan Barnbrook (1992). 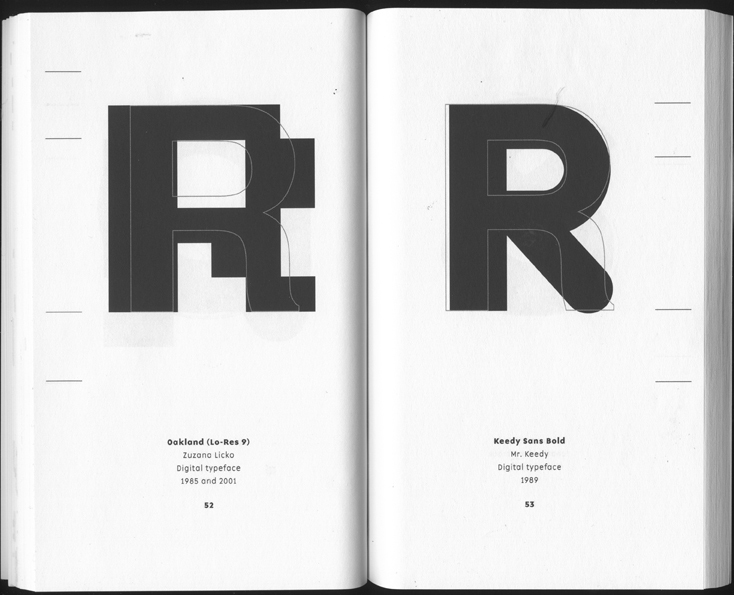 It is more a novel type specimen than a detailed look at these “era-deﬁning” typefaces. 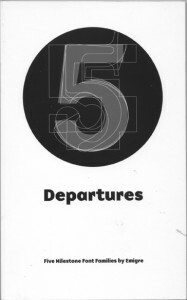 Departures consists of a spread dedicated to each font—one page consisting of basic background information and a short explanation of why the font is “era-deﬁning” and the opposite page full of words characterizing the face set in it—followed by sample letters and ﬁgures selected from the fonts. These sample characters are printed in solid black on top of the outlines of the same character from Helvetica Bold at 286 pt. VanderLans chose Helvetica for the comparisons because of its ubiquity: “It has set a standard of utility, standardization, and timelessness that all fonts are measured against.” Once again, ubiquity begets ubiquity. Surprisingly, it is Helvetica Bold not regular or medium (the weight favored by most modernist designers). His conceit is that, since the ﬁrst typeface acquired by the Museum of Modern Art, was a 36 pt fount of Helvetica Bold (donated by Lars Müller in the wake of the tiny Helvetica exhibition mounted by the museum a few years ago), Helvetica Bold is the perfect “standard” by which to compare the Emigre fonts. Thus, the title of the book is a riff on MoMA’s exhibition in celebration of their acquisition of digital fonts: Standard Deviations. The ﬁve Emigre fonts are all departures from the standard, though; not, in the eyes of Emigre, deviations. The version of Helvetica Bold used is not the foundry one from Stempel but the Adobe version, “the most widely used [digital] version, and closest in design to the original lead type.” Why Adobe when their version is licensed from Linotype? And is it really the closest in design to the original lead type? Tom Carnase and Baruch Gorkin, the authors of Type: The Best in Digital Classic Text Fonts by (Zurich: Graphis Press Corp., 1995), prefer the version from H. Berthold AG. They took into account outlines, ink traps, sidebearings and hinting in making their decision. However, they do not make explicit comparisons to the metal Helvetica. But neither does VanderLans. Of course, one problem is that metal type did not come in sizes large enough for the displays in Departures. However, poster sizes of Helvetica were made in wood, plastic or aluminum according to Helvetica Forever: Story of a Typeface by Victor Malsy and Lars Müller (Baden: Lars Müller Publishers, 2009). Helvetica Bold Poster was issued in 1965. This design was not identical to the one in lead as metal type was always adjusted from size to size. This complicates any attempt to match a digital version of Helvetica to a lead (or plastic etc.) one. In the end, these quibbles do not matter much to the point that VanderLans is trying to make in Departures, which is to show how radical the Emigre fonts are compared to a “classic” typeface from the pre-digital era. The Emigre faces, “known for their idiosyncracies, individuality, and unique features,” are indeed deviations from the norm. This comes through most clearly in letters that are round or have diagonal strokes. However, the comparisons vary in quality. Mason is the least successful since it is the only seriffed face among the group. (Dead History is semi-seriffed.) It is essentially an oldstyle face and thus as different from Helvetica as Bembo or ITC Galliard. It might have beneﬁted from being compared to Times Roman instead, but that would have diluted the point of 5 Departures. The quirky features of the other four fonts come to the fore when overlaid on Helvetica Bold. The idiosyncratic inktraps and tapered strokes of Template Gothic, the seemingly random stroke endings and parts of Keedy Sans, the mix of sans serif and serif features of Dead History, and the coarse bitmapping of Oakland are all on display. Some of the speciﬁc combinations that are most illuminating are: F and G for Keedy Sans; N, Q, R and X for Oakland; J and K for Mason; M, T, X and q for Dead History; and a and 5 for Template Gothic. There are no comparisons to punctuation. As a type specimen Departures is a departure from the norm. It is instructive and should reinvigorate interest in these quintessential Emigre fonts. It also shows how deﬁcient MoMA’s Standard Deviations exhibition is. In these pages VanderLans has done more than the museum to visually explain why there was an uproar in the type world between 1985 and 1995. He has done it succintly and clearly. This is a modernist design in postmodern clothing. Base 900, the text face of Departures, is legible yet not neutral in the modernist manner. It is unfortunate that VanderLans did not include an addenda showing it against Helvetica Bold—or, better yet, Helvetica Regular. But his cover, with its overlapping series of 5s, makes up for this minor lapse. It is reminiscent of Jasper Johns’ number paintings, a subtle reminder that, long before Emigre, there was an alternative to Helvetica.